” The meat is in the street,” John Wimber used to say. Jesus had just prophesied open the heart of a fallen, theologically-confused woman and brought salvation to a village. Though He was tired and thirsty (vv. 6-7) and doubtless also hungry, seeing God glorified in the goodness mediated through His own words and actions was more deeply satisfying than the choicest meat and drink. I recall being cautioned, in Seminary, against Wimber’s contention that the kind of empowered ministry Jesus engaged in here was just the kind of thing we as disciples should do, following in His footsteps. This, despite His explicit instructions immediately afterward to see the “harvest” as He did as well as His reminder that they are commissioned to be “reapers.” The works He did in the Father’s name, everyone who believes in Him will… may… should… do in His name (John 14:12). Let’s get it and let’s do it. I have a sweet story from some who are learning to “do the stuff” or rather who are going out and doing it. A team of students from a training program at a Dallas church step out each week to lift up their eyes to the Spirit’s leading and do the works in His power which have been prepared for them. Here’s what happened two weeks ago today. In the morning team leader “C” found himself driving to the church out of his usual route, for some reason. Passing a coffeehouse he had seen but not visited, he sensed his attention being drawn to it and figured this might the spot the Spirit was sending his team to that day. So there they went, and when C stepped in and saw a familiar face, he knew one of the reasons they were there. The man was a minister–an evangelist–and C had known him slightly, as a customer in a different coffeehouse where C had once been an employee. So C and another team member, “M” (both men, as it happens) sat down and began to chat with him. Meanwhile, students “F” and “S” (women, as it happens) took a look around, looking and listening for what the Spirit might be saying to them. An adjoining room where patrons sat sipping Java had artwork displayed along the walls. One odd painting caught F’s eye, because it had a small inscription in French, her native language. It read “Pour le corps,” that is “For the body.” Across the top of it a row of human figures stood holding their hands on their bellies. Below them a vicious-looking blob with bared fangs turned menacingly toward a pair of vaguely tear-shaped objects. Weird picture. “Looks like a liver to me,” F told S, about the lopsided teardrops, and they decided to go for it. The painting hung on the wall over a lady, like a sign, and after introducing themselves to her, they casually asked her if perhaps she had had issues with her liver. In fact she had, for not a week earlier she had been diagnosed with liver cancer. She declined their offer to pray for her healing, however, first since she was a Muslim and second because she had confidence in the treatment she had been prescribed. She was interested in talking to the ladies however. As it happens the lady was Turkish, while F is French and S Lebanese. And they talked about Jesus, who the lady, being Moslem, said did not die on the cross. Our two ladies explained not only how He did, but why. In short, they preached her the gospel. Though she declined prayer for healing, she was happy to let them give her a blessing as she was leaving. So bless her they did, with a request for Jesus to reveal Himself to her–even in her dreams, as is reportedly not uncommon among Muslims. Saying goodbye, she kissed them on the cheek, one cultural feature all three had in common. Would she be healed? Would she come to faith in Jesus? This we likely will now know. But did she hear God’s word and sense His love from God’s people? Without question. Meanwhile C and M were still talking with the coffee-loving minister, and by this time speaking words of encouragement over him, for he was sorely in need of encouragement it seems. F and S joined them, as their lady had left, and a mental image of a little girl flashed through F’s mind. She thought “daughter.” At the same time a cloud-like shape in the mottled floor pattern seemed to jump out at her, reminding her of a “thought balloon” you see in the comics. Had the man been thinking about his daughter? A second before she could ask, M “stole her thunder.” “Do you have a daughter?” he asked the man. In fact he did, though he had lost contact with her for years. She was grown and living in New York. But she had been on his mind, a great deal, as he was hoping and praying to be able to restore their relationship, which had long since become estranged. So they prayed for this, of course. Now as for what happened as they were finishing up, you have to understand that this was July in Texas and it was a typical sultry Dallas day, under a clear sky, the hot, humid air lay motionless on us all day. I can testify to that. 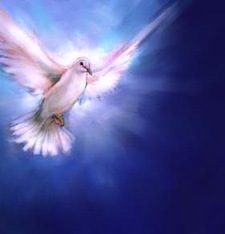 C’s prayer for the man had been, among other likely phrases, that God’s Spirit would blow afresh over his ministry–which refreshment he needed. They had stepped out the front door, accompanying him toward his car, when a sudden gust of wind came along, nearly knocking the table umbrellas over, and picking up fallen leaves and pedals from the bushes and swirling them in a vortex. The man and our team stared in amazement. The event was so striking, several patrons inside the shop ran out to see what was happening. The moment then stepped off the curb, however, the wind stopped. One man who had stepped out was impressed. “Would you mind praying for me too?” he asked. And so they did. What do we make of this kind of thing? Acts quality? Not quite, but frankly, I think it’s getting there. Not momentous, not earth-shattering. No thousands were saved. Perhaps not one person was saved through this outing. But people were loved in Jesus name. People heard the good news. People were encouraged. People were prayed for and blessed. And for those with eyes to see, God showed Himself alive and well. Is it easy enough to toss off every one of these details as imagination, coincidence, simple natural occurrence. Absolutely. And please do so if that is what you wish. But I think it is a little, sweet example of how the Holy Spirit testifies to Jesus through His people and brings glory to the Father. And it is useful for illustrating a few of the ways the Lord speaks to us, as Jesus promised He would, and leads us into the works prepared beforehand that we should walk in. It’s a remarkable report, or I guess I wouldn’t be writing about it. But really, if we believe our Lord, this is simply normal Christian life. I see a screen in front of me. On it I see sin being committed. I know the details because the details are right there before my eyes–fellow believers acting in shameful and disgusting ways. No this isn’t some kind of visionary experince–just the internet. You can have the same experience too, if you think you can stand it–by clicking on this link and reading Phil Johnson’s cyber-slander of Mark Driscoll. If you are so inclined you can join in the all-you-can eat sin-fest offered there. The waters are nicely chummed, and the jaws have not been idle. I hadn’t planned to do a Pyromaniac hat trick (DP, FT, and now PJ), but the guys are on an anti-Continuationist tear–and are at it still, each of the Pyros seemingly trying to outdo the other in their Cesso fervor. I can’t even keep up with ’em. This one’s all about a five minute video, clipped and edited from an hour-long message on Spiritual Warfare presented in Februrary 2008, and specifically posted on Youtube by Phil Johnson, for the purpose of inflaming opposition to Driscoll. To ensure that viewers will treat it as scandalous, he qualifies the video as “extremely disturbing” and entitles his post, “Pornographic Divination.” In case his subtlety is lost on you, he is accusing his brother of a double abomination. Nice. The center piece of the video is surely a one-minute description of what Driscoll presents as a visionary experience through which he had detailed knowledge of a woman’s unconfessed sin. Evidently the woman, along with her husband, had consulted Driscoll in regard to a spiritual problem, and because he believed the incident left a significant foothold for demonic oppression, he confronted her with the facts of the matter. Now whether or not Driscoll leaves himself open to criticism over this story, Johnson’s labeling of the incident either as “pornographic” or “divination” is wicked–many times more sleazy than the putative scandal he attempt to construct from Driscoll’s words. And the subsequent comment thread once again demonstrates the power of a little blood in the water. “Fish are friends not food,” chanted the twelve-stepping sharks. Remember the ichthys? Identifying a brother in Christ. They’re not food either, chum. Jesus said to her, “You are right in saying, ‘I have no husband’;for you have had five husbands, and the one you now have is not your husband. What you have said is true.”The woman said to him, “Sir, I perceive that you are a prophet. (John 4:17-19). That the revelation behind prophecy can be through a visual experience is also perfectly Biblical, as on a large scale, the book of Revelation shows us. As does, on a smaller scale, Jesus’ vision of Nathanial. Nathanael said to him, “How do you know me?” Jesus answered him, “Before Philip called you, when you were under the fig tree, I saw you.”Nathanael answered him, “Rabbi, you are the Son of God! You are the King of Israel!”Jesus answered him, “Because I said to you, ‘I saw you under the fig tree,’ do you believe? You will see greater things than these.” (John 1:48-50). Johnson objects as well to Driscoll’s using the term “discernment” in regard to this activity, and he cites a couple of verses on “discernment” to show Driscoll guilty of “bad teaching,” saying that the Biblical “gift of discernment” is quite different from this. But what Driscoll is actually referring to is “discernment of spirits,” which he abbreviates simply “discernment.” Recall that this talk is over an hour long, and the clip is five minutes of this. There is certainly “discernment” which has nothing to do with evil spirits, but this does not negate the validity of discernment of Spirits. Part of the confusion here is that the clip really is torn from context. The message is about “Spiritual Warfare,” dealing with demons who are oppressing people. This is where “discernment of spirits” comes in, and why Driscoll specifically deals with a past unconfessed sin. The aspect of “discernment of spirits” that is involved is determining why a person may be susceptible to demonic oppression. And the revelation that Driscoll refers to serves that function. Whether the particular instances Driscoll cites are genuine or not, the practices he is teaching about in this video, discernment of spirits, revelation from the Holy Spirit, confronting another regarding sin, have a high Scriptural pedigree, the kind of actions engaged in by Christ and the apostles. Johnson’s charge is thus slanderous at best and perhaps even blaspemous. One speaking on the basis of revelation, such as Driscoll describes ought therefore to voice conclusions tentatively. And this is precisely what he says he does in the video. He clearly states he does not “know” the details to be factual, but thinks they are. He then advises the person to verify the facts. Incredibly, Johnson accuses Driscoll of accusing people of serious sins–on the basis of imperfect knowledge. Of course, Johnson does not claim perfect knowledge of Driscoll’s actions. If he contacted him directly prior to posting his screed, he does not indicate it. At least Driscoll advises verification. Johnson just forges ahead based on his own prejudice, and blasts the man before a potential audience of every living man, woman and child in the world. 3. Johnson criticized Driscoll for mentioning graphic details. Once again, he is evidently referring to the one minute section about the woman’s affair. “Salacious details” is the term Johnson uses. He does indicate the man “climbed on top,” but beyond this the details include hair and eye color, type of bedspread, and approximate year. It is about as “salacious” as your average PG movie love scene. By contrast, due to all the blood-letting, Johnson’s post and comment stream have to be at least PG-13. He may have a point though, that this level of detail is unnecessary. Driscoll’s point, I take it, was to show that visionary revelation may be quite specific and accurate. Neither the video nor Johnson’s post tells us whether Driscoll’s description was accurate. Cessationists are wont to complain of contemporary prophecy and “words of knowledge” as being vague and insipid. Or else the putative prophet is merely engaged in cold reading. One of Johnson’s colleagues, Dan Phillips recently wagged that arguing for Continuationism was “self-refuting” since genuinely miraculous results ought to speak for themselves. So when a prophecy is vague many Cessationists complain of lack of verifiable detail. When it is anything but vague, it contains unnecessary information. If it turns out to be correct, it is a good guess. If it is beyond the power of a good guess… could it be Satan? 4. Evidently it is, Johnson suggests, because the Holy Spirit’s eyes are too holy to look on sin. Clearly, the least sin is perfectly abhorrent to the Godhead, and God cannot look on sin approvingly. But remember that the Spirit is sent to “convict the world concerning sin and righteousness and judgment.” (John 16:8). Are we to imagine that sexual sin is beyond His ken, or more repugnant than pride, malice, and strife? He empowers prophecy to reveal the secrets of the heart (1 Cor. 14:24). And, O gentle reader, if you are a believer, He indwells you. And you Mr. Johnson. Who will say that living in such places as your heart and mine He has not been witness to much more sordid spectacles? 5. Johnson further reveals his prejudice in characterizing Driscoll’s statement as “whacko fringe,” cleverly changed to “whacko mainstream.” What? Is he encountering a ten-story Jesus? Is it about Christ’s face on a tortilla? What exactly is “whacko” about revealing the secrets of the heart through the power of the Holy Spirit to the glory of God and calling sinners to repentence? What then passes Johnson’s imprimatur for a Continuationist? Muttering in tongues in one’s closet? A little prayer, a little oil? Saying pretty please to demons? Johnson then rounds up some of the usual suspects, such as Toronto or Paul Cain, matters he seems to understand poorly–despite some curiously strong opinions–in order to besmirch his “theological betters” as his ilk would put it, such as Wayne Grudem, John Piper, Jack Deere, and Sam Storms. 6. Finally, calls Continuationism a “leaky Canon” and Continuationists loose cannons. Frankly, this shows him clueless, as Spirit-empowered ministry is no threat to the Canon or Scripture. He seriously misunderstands Sola Scriptura. And while any contemporary ministry is weakened through the failings of the feeble human being engaged in it, Spiritual Warfare, discernment of spirits, prophecy and such are not unique in this, but are under the authority and scrutiny of Scripture. But so is theo-blogging. In short the characterization of this short video as “extremely disturbing” or “pornographic” or in any way scandalous is seriously contrived, distorted, overblown. Are there, though, any points of concern or question? Sure. Not for censure of Driscoll as an “out of control” charismaniac. I do get the impression such a conclusion is a “consummation devoutly to be wished.” So that this nigh-on four year old snippet can be puffed into a full-blown scandal, then well done thou good and faithful. Driscoll is an outspoken, and I have to say at least at times well-spoken advocate for Spirit-empowered ministry. He’s also (more than) a little “in your face,” having qualified hard cessationists at least as “worldly.” (Insert gasp here.) The Pyroids don’t seem to have taken this lying down. Naturally their recent flurry of post after post of anti-Continuationist lather is entirely unrelated to any hurt feelings over Driscoll’s mean and nasty name calling. But the short video can serve as a springboard for instruction, not on whether or not to engage in Spirit-empowered ministry—that is a given—given by our Lord, but in how to go about it. What guidelines can we draw? This can be done by asking questions. Driscoll has no need for me to defend him. Indeed I know very little about him. I have not followed him at all, but have been positively impressed by some things he has said. Still, this video opens the door to some questions, which might invite criticism in a few areas. So I will address the questions to him, that I would wish to ask if meeting in person. Not as an accusation, but as assistance in keeping the edges of the iron sharp and clean. And what I think may be good counsel to anyone in such a situation. 1. Have you resisted the temptation to be awesome? It was not always clear, since I don’t really know you, that you were not reveling at least a little in an image as one of the “big guys.” As you know, this has no place in this kind of ministry. So watch over your heart and guard it from pride in your abilities. Paul needed a thorn in the flesh to keep him from pride because of the visions. Will that be necessary in your case? 2.I don’t agree with your critics that what you related was “pornographic,” but at the same time, you have to be on guard against corrupted revelation. Visionary experience operates, I would suppose, on the same mental “equipment” as imagination, just as revelatory dreams operate in the space where normal dreams occur. I don’t absolutely know this of course, but if any bits of your own imagination—not to mention fantasy—can break off, as it were, and get mixed in with the revelatory content, you have to detect this and guard against it. I can’t tell you whether this has occurred. But a number of your viewers not only suspect this, but are convinced it is nothing but your imagination. Consider guarding against any misunderstanding—much less correct understanding—which would give opponents cause to blaspheme. 3.Do you consider that receiving revelation about someone is different from permission to share it with that person? In your story about the woman, the circumstances were not quite clear to me. I would be concerned about sharing that kind of material to or about a person in front of others, particularly the person’s spouse. I’m not sure from your sketchy account how the sequence of events transpired. It is to be hoped that such things are done with discretion, dignity, and tact. This five-minute clip did not go into discretion, dignity, and tact. Perhaps you do later in the presentation. 4. Dealing with issues of abuse and other instances when the subject was a child, it is important not to suggest or implant alien ideas that might be false but taken as reality, whether or not confirmed by the subject later. Again, this bit of video does not dwell on how you did, or on how one ought to go about this very delicate matter. Perhaps you do later. If not consider doing so in the future. None of us is free from sin, and even our best efforts are tainted with our sinfulness. The Scripture tells us even our righteousnesses are as “filthy rags” (Is. 64:6). And if I were to spell out in “lurid” detail what that phrase actually means, I might be the next victim of the feeding frenzy.